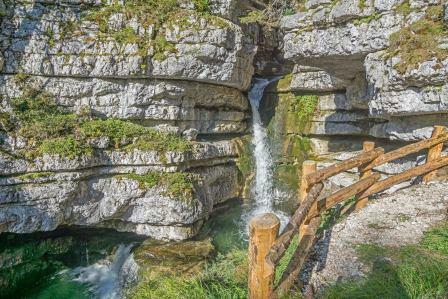 This short and charming path has been recently equipped for safety to promote the sequence of waterfall and pondscrated by the Boite river just below Malga Ra Stuat thatmake this itinerary extremly interestingfor its hydrologic peculiarities. It is not veritable Via Ferrata, rather a trail equipped with boardwalks, little bridges and a few steps over exposed craggy sections, also tailored for hikers. although very short and little demanding, it must not be attempted wehn the terrain is frozen or in case of flooding.